Climb aboard and the first thing we noticed is ‘space’. The imposing console curves around the front of you rather like a protective bubble yet the whole machine is big enough to give the feeling of unrestrictive freedom of movement. With there being 80 cm of space between the handlebars coupled with a 50cm x 140cm deck means you have plenty of room to move…. which is fortunate, because the ZR11 sure can move! 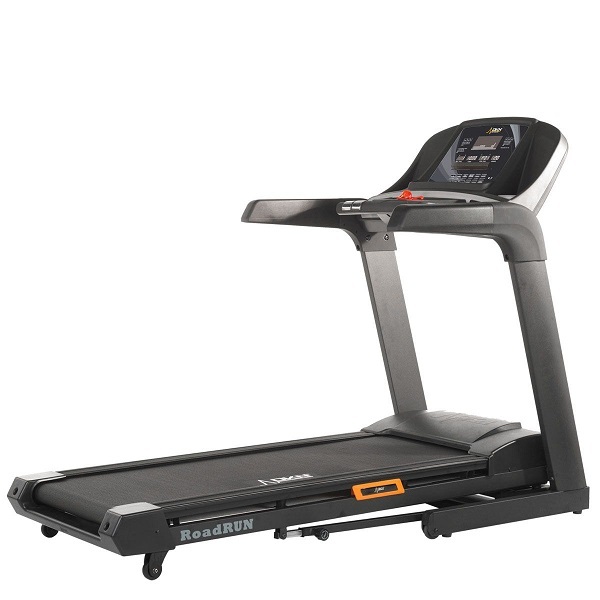 While the deck is large for a Reebok machine, it must be pointed out it’s still just about the smallest available by quite a margin on treadmills at this price point. There is a 2.5 Continuous horsepower motor under the hood putting out a top speed of over 11 miles per hour. 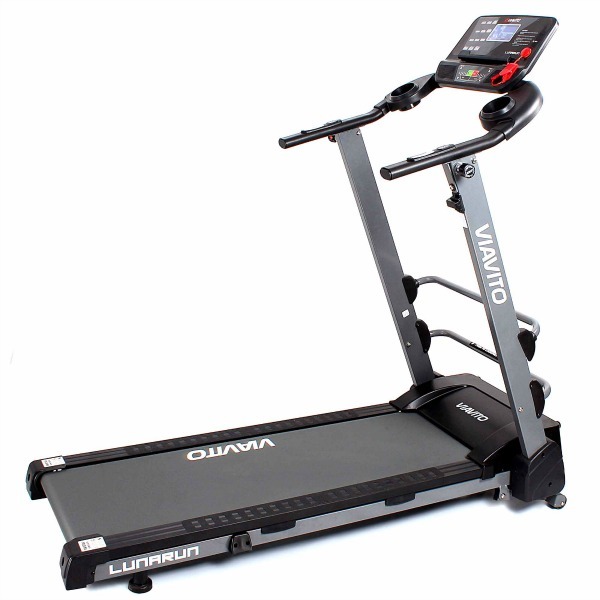 Such capabilities may come as no surprise on a machine from a manufacturer like Reebok, however, what is unexpected is the size of the motor relative to the price. While clearly the quality is what you’d expect from Reebok it’s small when compared with its competitors operating in the same marketplace. On the plus side, even at full pace, the 2.5” thick rollers make for a disturbance free workout. 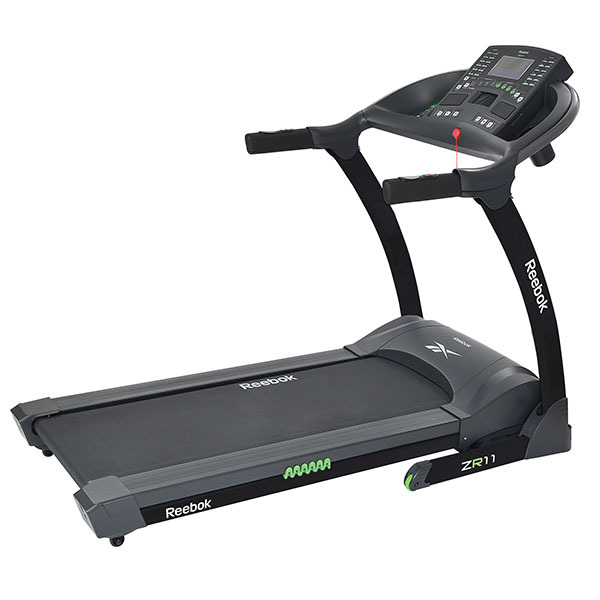 The combination of high quality parts, plenty of power (2.5hp is not small in its own right) and the running area certainly suggests that this machine is suitable for runners; but it’s the bright green zigzags you can see under the deck that give another indication of its potential. These zigzags are not just a cosmetic design detail, they are in fact all part of a rather unique cushioning system. Reebok call it Zigtech technology and the wording behind its marketing certainly makes for interesting reading! If you do not misinterpret any notion that “ by harnessing the shockwaves made by running” the zigtech technology will somehow act as some sort of energy releasing spring board (Our words not Reebok’s!) then you should be pleased with how the cushioning does its job (it simply but effectively, absorbs impact!). The Zigzag elastomers do everything you’d wish any regular shaped ones to do (perhaps they are even more effective –perhaps?) but what counts overall is that when we ran on the ZR11 it felt good !– overall there was enough space, enough speed and enough shock absorption. When it comes to fancy features however, this model has more than ‘enough’ – it’s absolutely teeming with goodies! Moving to the chunky side handlebars, you’ll find the pulse grip sensors. Plus this model has an inbuilt receiver for wireless pulse monitoring. To enjoy greater accuracy of readings and for the 3 Heart rate controlled programs on offer, we’d highly recommend investing in a chest strap monitor. Keeping hold of the pulse grip sensors keeps you in convenient reach of the thumb controls on either handlebar. On the right you have speed adjustment and on the left are controls for incline. (Another nice touch is that the buttons are coloured green for ‘plus’ and red for ‘minus’). There are plenty of other controls positioned around the console. Aside from the usual ‘up and down’ buttons, there is the added bonus of having quick keys. For instant speed adjustment there are 4 buttons ranging from 4km/h to 16 km/h, rising in 4km increments (and they are also labelled in mph too!). Mirrored to the left are 4 buttons for adjustments to the incline levels. These can instantly set the gradient at level 2, 5, 10 or 15. The console is laden with features, yet it’s so clearly laid out and well presented, that it’s not in the least bit overwhelming. The ZR11 boasts a massive array of pre-set programs and the designers have managed to clearly print every one of the 24 course profiles (Yes 24!) either side of the screen in a handy menu. As if that lot wasn’t enough to keep your mind and body occupied, you have the 3 HRC programs we mentioned before plus a manual one, 3 user-defined programs and target time, target distance AND target calorie programs to set up to your own preferences. There is also the option of a ‘Body fat function’. After selecting this program and imputing your gender, weight and height you can hold onto the pulse sensors for about 8 seconds before your ‘results’ are displayed. The figures that appear on screen are supposed to indicate which category of Underweight/Normal/Overweight or Obese you fall into!? The fact that we are forever nagging readers to use Chest strap transmitters to avoid false readings from pulse grip sensors, should highlight how notoriously inaccurate hand sensors are in general. Therefore, we urge anyone with a sensitive disposition to avoid this feature at the risk of it causing offence! Instead we would recommend you keep motivated by simply watching your progress and all of your training data during your regular workouts – and that can all be done at a glance of the display screen. Like the rest of the console, the screen is clearly and simply laid out. Plenty of space is given to the time and distance readouts with all other data such as calories, pulse, speed and incline shown in a strip of boxes down the right hand side and backlit in blue. The remainder of the screen is filled with a yellow backlit section displaying a series of vibrant blocks indicating the intensity levels or course profiles. Elsewhere around the console are various ‘extras’ for your enjoyment. For starters you have a fan housed in the middle. Although a little noisy in operation, it does give out some refreshing cool air and the tilting vents help the direction of flow. Either side of the fan vent are small speakers. Despite their compact size, they did deliver a decent sound once we’d plugged an MP3 player into the jack plug. Not only are there handy buttons to control the volume via the console, there are also nice big storage holders either side of the console with loads of room to keep your iPod safe and plenty more possessions at hand. Plus a bottle holder set into the compartment can hold your drink securely in place. 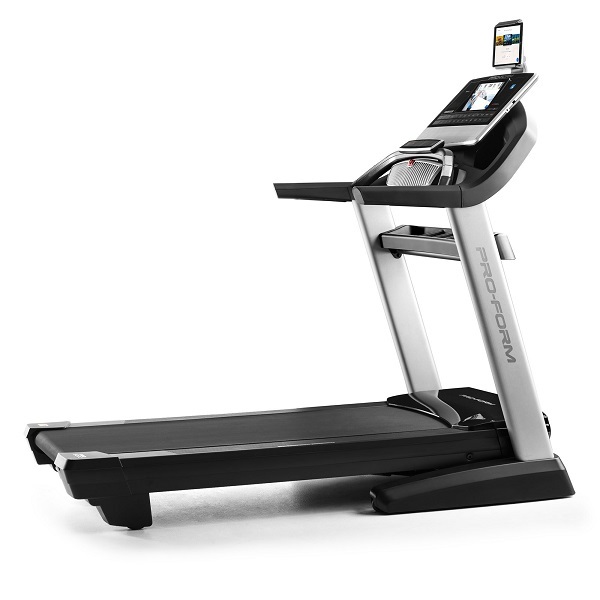 When your workout is over, the deck can be fairly easily folded and locks in place by a foot-release mechanism. Sure, this isn’t the lightest machine to raise up, or the most compact when folded, but then again the ZR11 isn’t designed to be lightweight and compact! 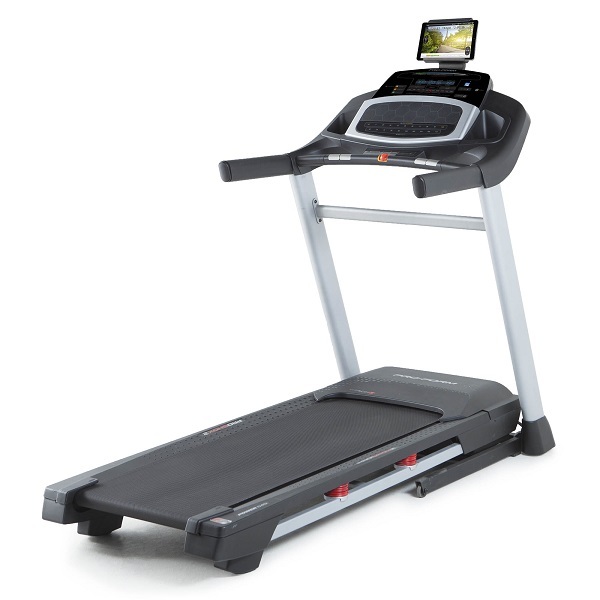 – This is a 115kg running machine with a full-size deck. We must confess that we deliberately set out to be rather skeptical and unforgiving in this review! We weren’t going to be swayed by the attraction of the mighty Reebok brand and its pretty looks before we put it through its paces! This machine isn’t just an example of well-marketed hype. Yes the jury is still out there on exactly how the zigtech cushioning system really works (!) 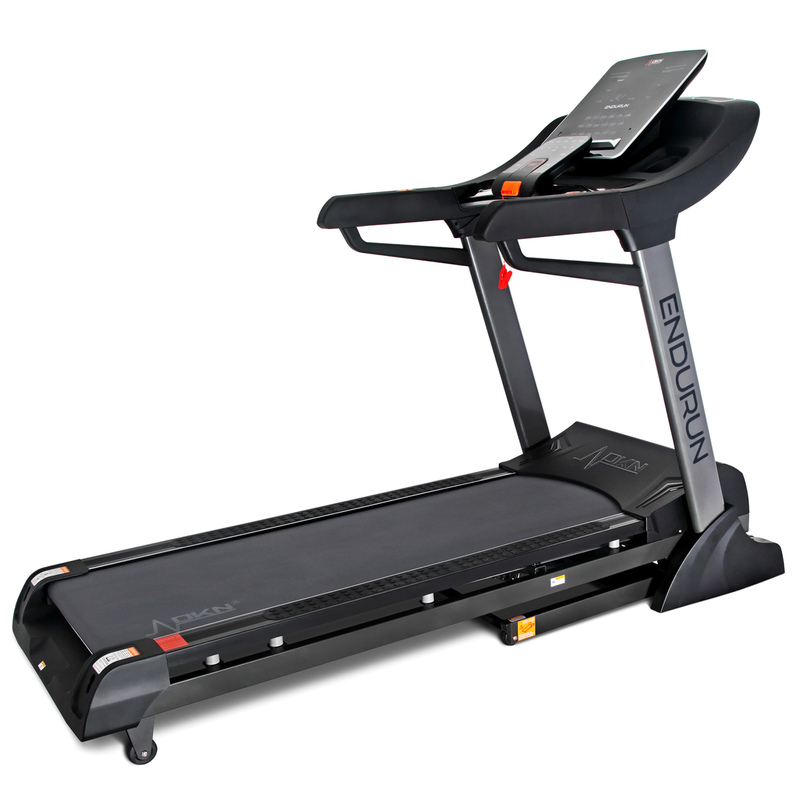 But we can’t deny that as far as shock absorption goes, it gave a comfortable running experience. When you combine ALL of the features and functions together it really is that workout ‘experience’ that makes the ZR11 a good choice. Although we could be hard-pressed to think of one singular area where the ZR11 truly exceeds expectation, it is a good all-rounder. 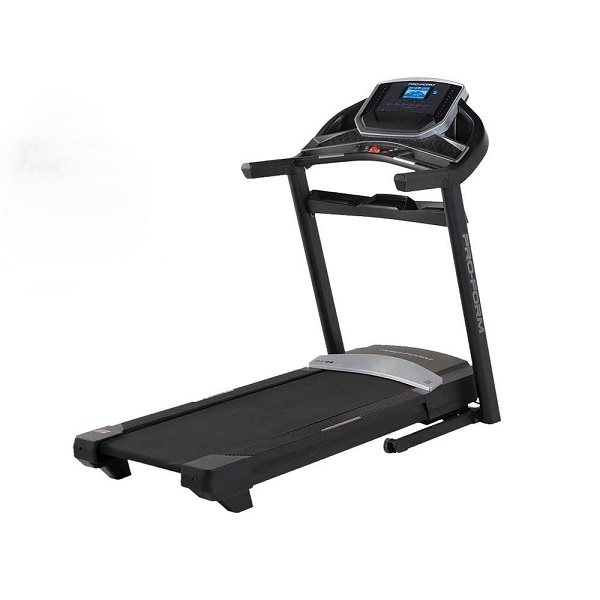 If you’re after a machine that has features jam-packed into a nice looking treadmill, we recommend you give your eyes a treat and check out the Reebok ZR11. Nice big rollers and good cushioning make the Reebok ZR11 a respectable choice. It's got a good range of workouts too. The major disappointment is the level of the incline on maximum setting as it's not all that steep. 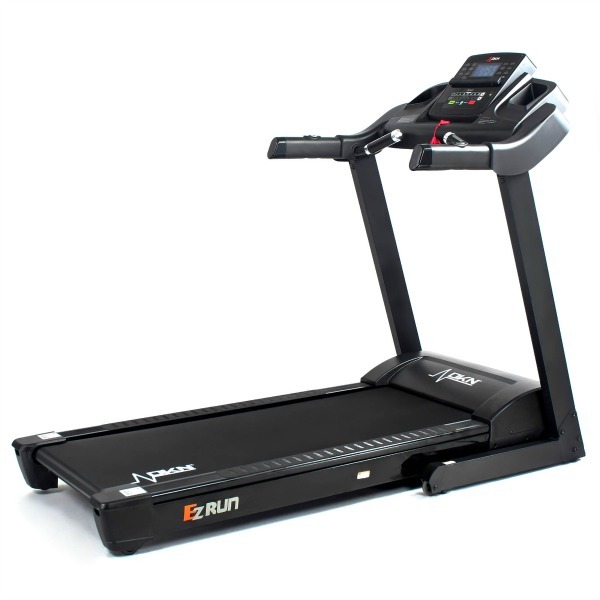 If you're considering this, it'd be worth having a look at the DKN EzRun treadmill offers a true 12% incline at a lower price . 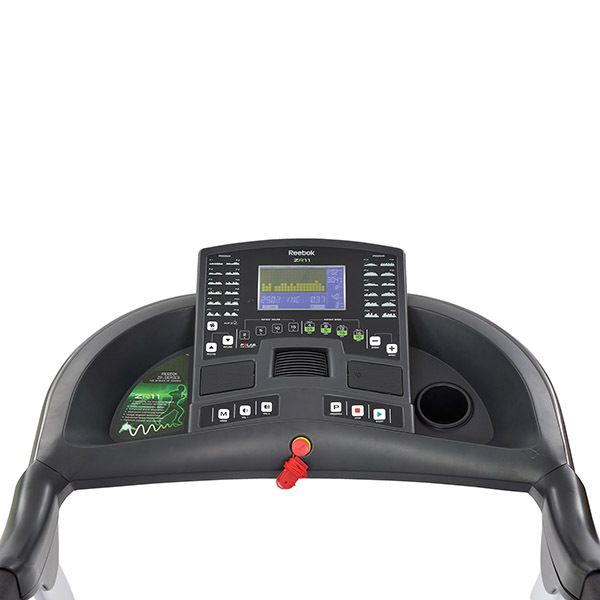 Another machine to consider from Reebok themselves would be the Jet 200 which has a similar deck size and is a fair bit lowered priced!